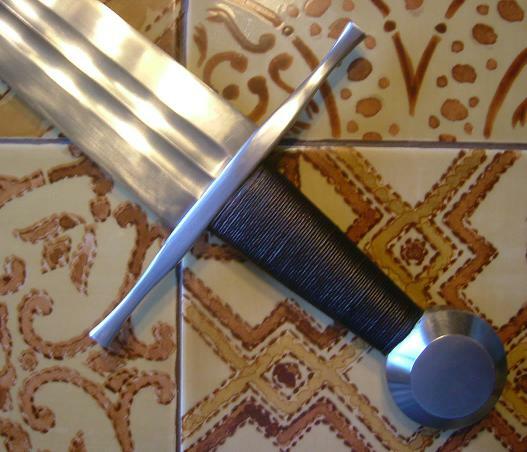 According to their web-site, Ollin Sword Design is a relatively new (5-6 yrs at this time), family-run company led by artistic director Mark Grzybowski, who had previous experience working with Albion and Rick Barrett. Some of their work runs toward the fantastical (notably the ‘Zombie Defense Collection) but they also have a production line of medieval-inspired swords and do custom work. Good things have been written about Ollin here at myArmoury, so I’ve been wanting to try them out. The Hart Sword is one that I’ve been watching at in particular. One guesses its named after a previous benefactor, and there is no other reference to a particular sword, but it is clearly based on the Medieval sword found in the River Witham and housed at the British Museum. This is a sword originally classified by Oakeshott as a type XII, but later grouped with X in ‘Records of the Medieval Sword’. Its a bit hard to date – could be anywhere between 1100-1300, with the middle ground being a safe bet. I have been admiring the original for some time, especially since a visit to London a couple of years ago. When the opportunity recently came up to purchase the Ollin version from Kult of Athena, I took it. 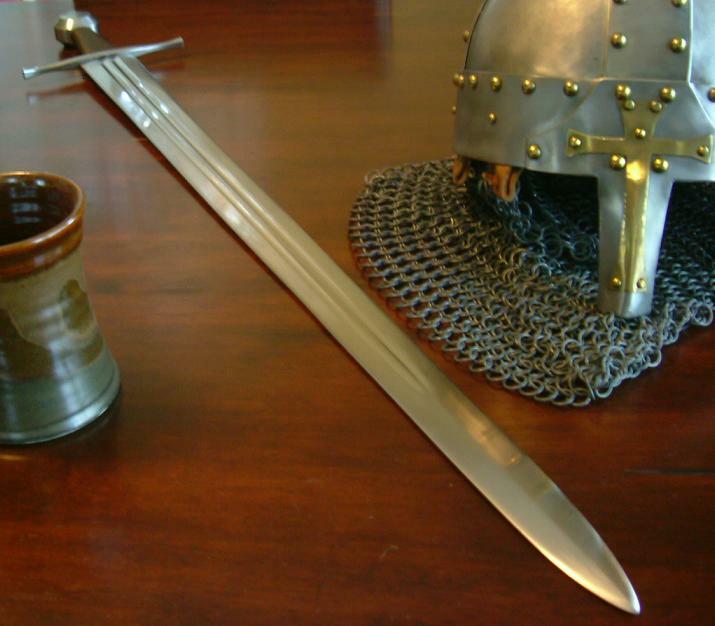 This is a single handed, broad-bladed medium-sized sword (see pictures below), likely too short for cavalry work but perfect for the shield wall. Its perhaps not fair to compare it to the Witham sword, since Ollin does not call it a reproduction, but I cannot help doing so. The original was richly decorated with (likely) gold inlay. The Hart sword is a plane soldier’s sword, except that it retains the fundamental eye-catching feature that makes this sword stand out: a relatively rare (for this period) double fuller. The original sword has a somewhat non-linear profile taper, starting convex, then retaining much of its width to the end of the fuller before gently sweeping toward the point. The Ollin version starts the same, but then strikes a linear taper until forming a more semi-spatulate point near the end. This stronger taper overall likely puts it into Oakeshott’s category XII. Interestingly, Oakeshott lists the length of the original the same as this sword, whereas the Brittish Museum web site gives it at least another inch. The cross is a simple, thin type 2 (more squarish toward the middle than the original) and the thick pommel is a type H/I, whereas the original was clearly an I, perhaps even bordering on J.
Blade Width: 2 3/16” (at cross), 1 ¾” (at end of fuller). Blade Thickness ~6mm at cross, ~3.5 mm after fuller. It’s not hard to guess at the handling performance of this sword from the stats above. It’s relatively heavy for its dimensions, owing to a heavy pommel and relatively thick blade. On the other hand its compact, has a decent PoB, and with its significant profile and distal taper, has a good mass distribution. This makes for a very solid feeling sword that is not ‘fishing rod’ light, but is not hard to move where you want it. With its fairly chisel-like edge up to the end of the fuller, it should be the classic ‘shield cracker’ (although I have no plans to test this theory). The end of the blade past the fuller has a slight diamond ridge, which is not historic for an X or XII, and adds a bit of unnecessary weight where it affects inertia (dynamic handling) the most. 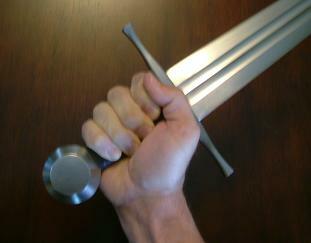 The pommel is too thick for a good hand-shake grip; this one works with the hammer grip (see below). One thing that detracts from the handling, in my opinion, is the wide but very thin grip. Although this shape provides excellent blade alignment, the combination of a heavy blade and the hammer grip position means that the narrow handle digs into the fingers when trying to stop the blade at a guard positions. This makes the blade harder to stop and produces discomfort after a while. Perhaps this would not be the case combined with thick gloves, but I would prefer a slightly thicker grip mated to a thicker, more rounded middle to the cross. The edge is quite sharp and shows no secondary bevel at all. The blade is not prone to vibration overall, although with its proximal harmonic node at the cross one does feel some vibration on the fingers when the blade strikes something. So far I have only sliced some backyard weeds (which it sailed through), but I would think this heavy, wide-bladed sword would be a ferocious cutter against medium and heavy targets, as noted above. Although this is clearly a cutter, the blade is quite stiff and easy to point (although heavy with the arm fully extended), so it should have good penetrating power in the thrust. For those who care about such things, I was disappointed that the blade has a fairly dull sound when struck, and only makes a faint whistle when swung at highest velocity. This, of course, is a matter of taste which has nothing to do with function. This sword is solidly peened together, although I do not know if it is hot peened. There is no hint of play or vibration in the hilt furniture. The highlight is the double fuller, which is perfectly executed for most of its length. The blade surface is also near-perfect for most of its length, with no ripples or grind marks. There are two minor flaws: a bit a of roughness to the blade finish near the cross (perhaps visible in figure 4 below) and a small wobble in the blade width at a couple of spots near the end of fuller (visible looking down the blade). 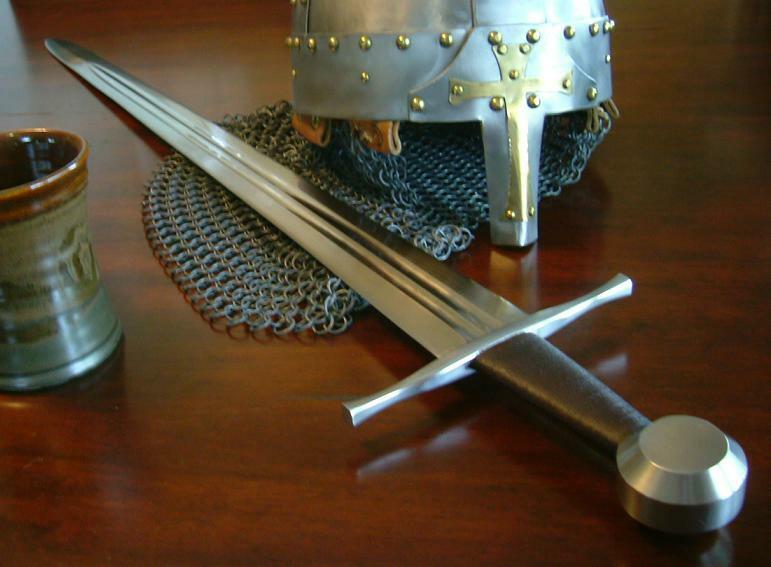 Such wobbles are common and often larger in lower-priced swords, but I have not seen them in swords of this price. The pommel is beautifully executed with the peen finished flush. The cross a bit less so –hard to put my finger on it, but it seems slightly rough- and as mentioned above I would have made it more rounded. Still overall the cross is elegant and refined in shape compared to the bulky crosses in lower-priced competitors. Finally, the thin leather grip is very nice (other than shape mentioned above), with a fine cord underwap (I believe, not just an overwap impression) which looks good and provides firm contact. Overall, this is quite a nice sword and a decent value for the money. It is handsome and functional sword that, with its double fuller, would add a lot to most collections of early medieval sword replicas. When I first got it I couldn’t help fussing a bit over differences from the original, but again, Ollin does not claim it is a replica of a particular sword and with time I am appreciating it more as its own sword. I do think that if one is particularly obsessed over the British Museum sword, it would be worth looking at the Albion version which is considerably more expensive, but more accurate (and a bit lighter). I was a bit surprised at a couple of flaws – they are quite trivial, but not usually present in the similar-priced competition. Also I had the impression that Ollin were perfectionists, so my expectations were super high. This might not have been one of the best they turned out – but you never know which one will get reviewed. A couple of things – like the ridge near the tip and blade finish near the cross – I intend to modify myself with my trusty sandpaper collection, which I've found can improve appearance and notably improve handling. The thin grip and minor edge wavers I will have to live with. But overall, I plan to hang on to this and would recommend it as a good representative of its type, and unique sword for the price. I know. If only I could. Thanks for the review J.D. So another unique sword to add to your great collection! This piece gives a noble and stern pressence. Even though it shares some facets of the witham sword I would think of it as a sort of "stockier" brother sword. I agree that by reducing the diamond section near the tip the sword's aesthetics would be improved. Smiths need to get this concept down- to stop putting diamond sections on these earlier examples. There are a few examples but they are certainly in the minority. Frankly, I don't know why it's still being done as much as it is in the industry. I really do like this piece though, as a generic sword in the "style" of the witham sword. Oh, and the grip wrap looks really nice. I prefer the full under-chord treatment to the overwrap that Albion is using. I'm happy that the Vigil does have a more typical underwrap- at least I think it does. I look forward to seeing it in person! Thanks Jeremy, that's a good way of looking at it -as a brother sword. I find the tough part about buying a replica of a particular piece (even though this one does not claim to be) is the expectations one has. Particulary if one is a perfectionist, which likely correlates to being a collector - maybe a mild for of obsessive-compulsive disorder? Still, it wouldn't take much to improve the historicity/handling on this model - Ollin puts thinner flattened cross-sections toward the tip section on some of their other swords, and a bit of bulge on the grip would still fit the narrow cross. They clearly have the talent - which is one of the reasons I wanted to provide detailed feedback here. Despite all that, the sword has grown on me and I'm enjoying the contrast it makes against my longer cavalry swords. It would be interesting to get a picture of mine next to your Vigil sometime.